‘Champagne’ sounds so French and therefore sophisticated. That’s because the drink comes from an area of the same name in France. A common opinion once held that champagne should be drunk only for special occasions. This understanding originates from the kings in ancient France that were the ones who used to drink it as a symbol of power and royalty. With its slightly golden colour and the distinctive bubbles it definitely implies something unique that can provide an unforgettable experience making you feel like a noble. Nowadays, this sparkling wine is easily accessible, but it is still believed that champagne is intended for special events. We wouldn’t try to argue with that opinion, but we can just hint that a special occasion doesn’t have to be waited for; it can be made. Why wait for it when you can create it? But don’t take this idea too far because you don’t want the unique moments to blend with your everyday life to such an extent that you won’t be able to distinguish them. Champagne goes perfectly side by side with flowers. Imagine a bouquet of flower and two glasses of this sparkling wine in a beautiful setting of your choice. It looks as if they are meant to be together. It’s not that champagne can’t present itself well on its own, but with flowers it just looks more festive. You can also add chocolate to those two, and it still won’t be too much. Flowers, champagne and chocolate sound so classic together. No wonder people have been relying on this combination for years as a gift to show love and affection, and some romance as well. It hasn’t, and it never will go out of style. Flower Shops specializes in making lovely flower arrangements for your special romantic events, and much more. We are glad that we can be part of your life in such moments of expressing your fondness for someone amazing. And as you’ve probably already guessed, we offer champagne, with or without chocolate, as well. And it’s not just any kind of champagne but the best quality. That’s because we want to spoil you at least for the several hours of your glorious moment. 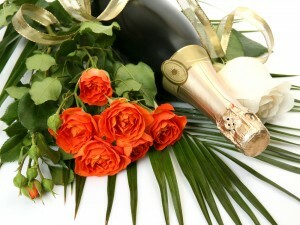 Wouldn’t you be delighted to receive champagne and flowers for your Wedding Anniversary, Birthday or Valentine’s Day? What a pleasant surprise, indeed! Our devoted florists can make any kind of flower bouquet according to your preferences or to the ones of your loved one. Their imaginative power spreads up to the sky and beyond, which always helps them be creative and innovative. We have surely chosen the most gifted people to become part of our team. Our flower delivery staff is also highly respected since they are the ones you will actually meet. And as flowers and champagne are usually related to celebrating love of all kinds, our delivery professionals bring them to you with a friendly smile and a polite demeanor. Flower Shops promises to never be late and to deliver fresh flower bouquets and cooled champagne, always. We have the proper vehicles that can keep the necessary temperature so that your flowers won’t fade and your sparkling wine won’t get warm before it’s brought to the given address. 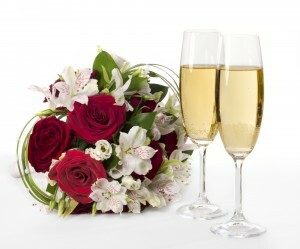 If you decide that we are the company which can fulfill all of your requirements regarding flower delivery combined with champagne, and/or chocolate, all you need to do is make a simple phone call on ‎020 3900 2440. Our fantastic office staff will make sure to give you all the information you’re interested in receiving.